OK I just wanted to let everyone know that there is something that I dislike about Spokane (other than the cops hiding by the high school to give me tickets, but that's another story). It gets dark so early!!! This picture was taken from my front porch at 4:30 in the afternoon! It looks and feels like it's at least 7 or 8. I am definitely not used to this, and I'm sure it will take some time for our bodies to adjust. Other than that we really are enjoying ourselves here. Undefeated!!! The team became the Gonzaga 2007 Flag Football Champions on November 8th. They had a great season sweeping the entire intramural competition. The final two games were cut short due to the mercy rule, that means that they were ahead by more than 20 something points. Just goes to show that they know how to play ball, even though they were dubbed by the other teams as "the old guys". We can't wait for basketball to start, so we can cheer on our team!! Who knows maybe it will be a triple crown year (football, basketball, and softball). I know it has been forever since I have taken the time to write a good entry, but life is crazy around here with two of the most darling little girls ever! Who wants to blog when you can play with your girls? So things here in Spokane are going great. I never imagined that I would love it as much as I have. Being away from family is hard and I am really really starting to be home sick (good thing we will be home for a visit next month), but I still love it. We have some great friends an a cute little apartment that is warm and cozy. Who could ask for more? As long as I have my wonderful hubby and my babies it's home! Speaking of my babies, Abby is so funny or she says the funniest things without realizing it. The other day we were watching The Biggest Loser on t.v. and Abby came running in saying "can I watch the biggest lizard too?" Levi and I both lost it, we were on the floor laughing. What a character!! and what can I say about Audrey... she is so darling and she steals our hearts every time she smiles. I was always nervous when I was pregnant with her that there was no way I could love another little baby as much as I loved Abby, but it is interesting your love just grows and becomes bigger (I hope that makes sense). Well if you can't tell I love my little girls more than life itself. They are the most wonderful blessing in our lives. Look at me I am just rambling on and on. Well I got a calling in our new ward. I am the Beehive/Mia maid advisor. I am really excited, I have always wanted to be in Young Womens and now I have the chance. I will be teaching three out of four Sundays a month, which is a lot, but better than Sunday school which was every Sunday. We only have about 7 girls in the whole Young Womens so it is really small, but I think that will be good, so I can get to know each of the girls really well. We have a brand new Presidency and they all seem every nice and fun to work with. It was interesting, in October's fast and testimony meeting I felt like I should get up and share my testimony, which is not something I do very often. So I got up shared my testimony. The next week I got a call from Brother Lynn the first counselor in the Bishopric. He came over and extended the call to serve in the Young Womens and told me that his wife (who is the YW president) said a prayer before the meeting that she would be inspired on who to call to serve with her. So I guess it was meant to be, there were also two other girls that shared their testimonies that same day and we are all now serving in YW. It's great to have such a good ward to be a part of. Most of you know that I am teaching dance at a little studio just around the corner from my house. It has proven to be a great escape for me to have a little free time. I teach a beginning Jazz class and I have done a little choreography and rehearsing. It is only about three to six hours a week, but it is nice to get out and have some "me time" and get some exercising in besides. Not to mention a little extra cash (every little bit helps when your living off loans). Speaking of loans, I am so grateful for education, even though we are going in debt. It is worth every penny. Levi is still really loving being in school and learning new things every day. He is such a great example to me to continue your education. Who knows maybe someday I can finish my degree. I would really love to! Just a little thanks to my hubby...thanks for sacrificing so much for our family, I know it will pay off in the end! I love you!! This post is beginning to get pretty lengthy so I will say goodbye for now and hopefully it won't take me so long to update you next time. Lots of love to everyone!! P.S. yes I did get my hair cut, and I love it. It is so much easier to do, it only takes like 10 mins YAH!! I will post some pics a little later. As you can see from the pictures Audrey absolutely loves to eat!!! She will eat anything. We try to just give her the baby food, but when she is hungry she doesn't care what it is as long as it is food!! So the table food that she has tried up to this point, and I might add loves are... canned green beans, cooked carrots, rice, banana bread, tortillas, black bean soup, I could go on and on. She just loves everything, which is nice because Abby wouldn't eat anything, only the milk in her bottle. So they are definitely different. It's fun to have two girls with totally different personalities. First of all can she get any cuter...well I know I am totally biased, but she is pretty cute. 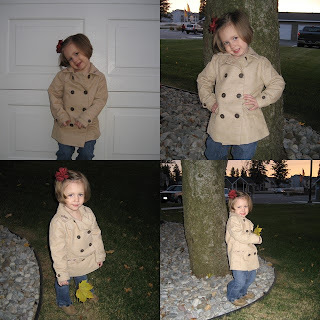 So Levi came home the other night and thought that she was dressed so cute and wanted some pictures of her. So we went outside and snapped a couple, and this is what we got. A little girl that thinks she is a model and will pose until the cows come home!! Abby loves getting her pictures taken and she also loves taking pictures. So fun to have a little girl enjoy being girlie!! So now that Audrey knows how to stand up to things there is no stopping her!! She is everywhere and really pretty fast! She loves Abby's bed as you can see. Lots of places to hold on to and to chew on (perfect). What a little shrimp, she is barely taller than the bed. So it seems that our little baby girl has taken a liking to doing big girl things!! As you can see from the videos she is all about crawling and climbing up to things. I can't believe that she is already doing all these things, she is barely 7 months!! She seems too little!!! I need her to stay little longer so that I don't get baby hungry to fast!! Don't worry I'm definitely not ready for another baby anytime soon. Anyhow Levi and I are really enjoying this stage. She babbles all the time and can't stop grinning, especially in the mornings! Kids are the best, I can't imagine life without them.